Once you feel comfortable with the basic spinning rhythm, have a look at the yarn that you have made. 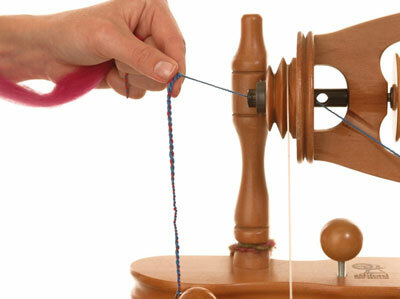 Pull some of the spun yarn back through the orifice of the wheel. Pull enough yarn back so that you have some of the yarn that was wound onto the bobbin in order to test it. Use your orifice hook as a weight. Let the yarn spin back on itself, and watch how the hook spins — the faster it twirls, the more twist there is in the yarn. The hook should spin to the right, then to the left, and then it should come to rest. Examine the appearance and feel of this yarn to see if it has the amount of twist that you want. If you need to adjust the tension on your wheel to get the desired amount of twist, it is best to adjust it while the wheel is spinning. This is because you can feel the changes better when the wheel is in motion. Too tight? Does the yarn look tightly spun, with extra twists of yarn that look like little corkscrews? Does it feel coarser than you thought it would? Is it wiry? If you answer “yes” to any of these questions, then it has too much twist. Spinners call this condition overspun. To avoid overspinning, you should move your hands a little more quickly. Check to make sure that you are not treadling too fast. If this does not correct the problem, then adjust the tension on the wheel. On a single-drive wheel, tighten the scotch brake, and on a double-drive wheel, tighten the tension knob. Remember to make these adjustments gently, a fraction of an inch at a time. Another cause of underspinning is treadling too slowly. This is unusual for a beginner, but some wheels do need to be treadled a bit faster than others. Too loose? Does the yarn look wispy? Is it hard to pull off the bobbin, even when all of the tension is released? Is it difficult to join new fiber? Is it too soft to work with? If you answer “yes” to any of these questions, then your yarn has too little twist. Spinners call this condition underspun. 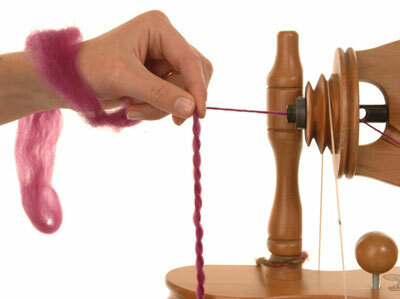 To get more twist in your yarn, you should move your hands more slowly. Watch the twist as it comes into the fiber below your fingers, and guide it slowly back to your fiber hand. You might need to adjust the tension on the wheel. If you have a single-drive wheel, then slightly loosen the tension on the brake. Check to see if the drive band is too tight; loosen it a bit until the wheel does not turn easily, and then tighten it up until the wheel starts to turn comfortably. If you have a double-drive wheel, loosen the tension knob (this loosens both the drive band and the bobbin).